In the two years since I first reviewed their flagship anthology title Reads, Avery Hill Publishing have gone from relatively unknown proponents of the DIY culture of comics creation to vital mainstays of the UK small press scene. 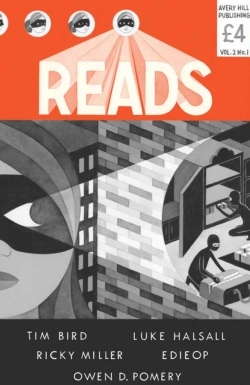 The first volume of Reads – particularly the initial couple of issues – was often a little rough around the edges and undeniably unpredictable in terms of technical proficiency; a chaotic mix of strips that could veer anywhere from the inspired to the somewhat rambling. But in amongst it all there was something inescapably endearing about the whole exercise – the self-deprecating tone of the editorial voice ensuring that you always wanted to come back for the next issue. As I have said in the past in ‘Small Pressganged’, though, those days of laughing with the AHP team as they knowingly ridiculed themselves are behind us now. This is, after all, the micropublisher behind Jazz Greenhill’s The Festival, Owen D. Pomery’s The Megatherium Club, Tim Bird’s Grey Area and Mike Medaglia’s Seasons. Indeed, it would be almost abject false modesty to apply that gentle self-mockery to Reads Volume 2 #1 because AHP now genuinely have a shopfront publication for their line; a high quality anthology comic that showcases the top talent from across the UK small press arena so readily associated with their output. The first crucial difference between the two iterations of Reads is that the element of randomness that was such a feature of the first volume has been replaced by a structured presentation of four features which will run across the entirety of this second incarnation’s four-issue run. Secondly, Reads Vol.2 has adopted a U.S.-size comics format which allows the art more space to breathe and handsome production values that, under that rather gorgeous Eleni Kalorkoti cover, give the book a polished, tactile feel. Ultimately though – and to perhaps state the rather obvious – gloss and lustre doesn’t make good comics, talent does. So has the new look Reads got what it takes to continue Avery Hill’s rise as one of the UK’s most exciting newer publishing outfits? The answer, I am pleased to say, is an indubitable “yes”. While the material still represents a welcome eclectic mix of styles and subject matter there’s a feeling of a long-term game plan here that was largely missing in the affable disorder of volume 1. 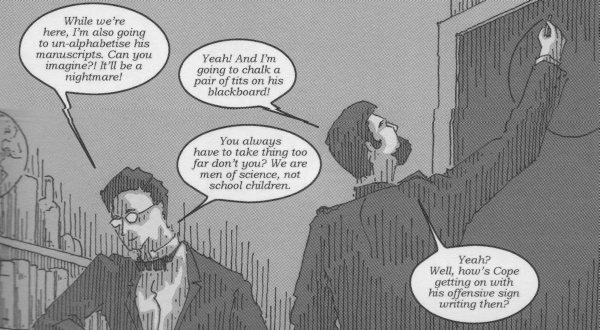 Following up on the critical acclaim of last year’s The Megatherium Club one-shot, Owen D. Pomery – whose final issues of Between the Billboards were recently reviewed in this column – returns to the environs of the 19th century Smithsonian Institute for more outrageously farcical exploits from the group of dissolute scientific adventurers who operate from within its walls. This time around the rowdy, but largely incompetent, hellraisers have to deal with an interloper in their midst – renowned palaeontologist Othniel Charles Marsh – and seek to undermine and humiliate the esteemed dinosaur hunter any way they can (above). Once again, Pomery’s juxtaposition of precise period detail with bawdy, contemporary slang and dodgy double entendres is sublime; that incongruous combination underlining the raucous absurdity of the piece to great comedic effect. Ricky Miller and Tim Bird’s ‘Hitchcock & Film’ was the surprise package of the issue for me. Creating a narrative that cuts back and forth between a history of the formative years of film and the life of Alfred Hitchcock in just a handful of 8-page episodes sounds like a thankless task. What is so noticeable here, though, is the clear thought that has gone into the formation of each page to fully exploit those storytelling conceits unique to comics. This isn’t, and couldn’t be, attempting to document anything remotely comprehensive in scope but what it does communicate with such concise efficiency is the pure essence of its subject matter. With the Lumiere Brothers, George Melies and Hitchcock’s childhood taking centre stage this issue, I look forward to seeing how this visual treat progresses in the next few issues. ‘The Bullpen’ – written by Luke James Halsall – is perhaps the lowest profile series in the book. It’s also illustrated by Tim Bird but, whereas ‘Hitchcock & Film’ gives him ample opportunity to really flex his artistic muscles, the gentler pacing of this story calls for a far less ostentatious approach. A kind of Mad Men view of the office politics of the early Silver Age, it follows Jack and Stan analogues as a new age of super-hero comics begins in late ‘50s America; invoking innovation and treachery in equal measures. At the moment it’s well enough executed, if perhaps somewhat slight in content, but I suspect this is a serial that may need more time to build its narrative. And, finally, we have the one colour strip in the issue and the entry I was most eagerly anticipating – EdieOP’s ‘The Story of Lucius Jellybean’ – a blob-like creature born of the accidental union of a slug and a virus-laden laboratory petri dish. Edie’s comics can, of course, be found lurking around “the sunny side of sinister” and I’ve reviewed her work on a number of occasions in the last year, most recently her small press comic/zine Dangerfun here. Poor Lucius just wants to make friends with those he encounters but, unfortunately, being a pandemic-inducing gelatinous mass means that finding someone to have chummy japes with is a difficult task. As ever with an EdieOP offering this is a pitch perfect blend of the childlike, the bleakly humorous and the really quite disturbing. Her upcoming first full-length graphic novel Maleficium from AHP later this year should be on everyone’s “must-buy” lists for 2014. When I first heard that Reads would be going the new volume route I will admit I was a little cynical about the need to adopt Marvel-style renumbering practices. I am not afraid to admit, however, that I was woefully, appallingly and unquestionably wrong. This is a genuine new beginning for the anthology, in terms of both strips and approach. An essential platform for a healthy representation of the creative voices that make up the AHP stable, and a true testament to the continuing evolution of this important micropublishing presence on the UK scene. For more on Avery Hill Publishing check out their site here. Reads Vol.2 #1 can be bought from their online store here priced £4.00. I thought 2013 would be a hard year for them to top but 2014 looks set to do just that!